Ask for availability if you need it right away as we don't stock a lot of these. 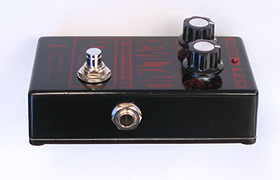 Analog Man carries the LAL DV Deathtortion DevilTail Distortion Pedal. A high gain distortion with a three band equalizer (HIGH, MID and LOW) can provide many sound variations. 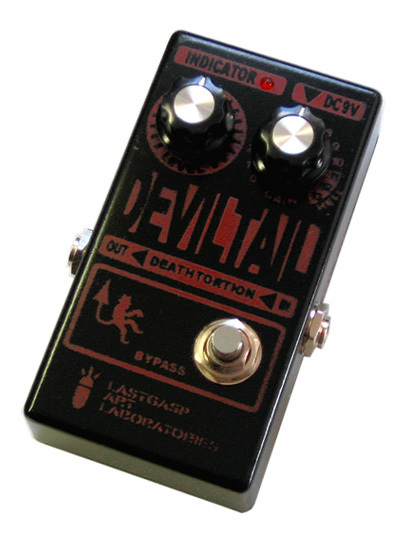 The "DEVILTAIL - deathtortion" (DV) is a very high gain distortion pedal. 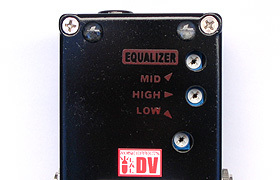 The "DV" is able to create a high gain distortion sound with a three band equalizer (HIGH, MID and LOW). It can provide many sound variations. The equalizer is on the back of the pedal so that once you find the right tone for you, it is easy to set. It can create your favorite distortion sounds with a three band equalizer eg: an energetic sound with not much distortion or super high gain distortion. From the left; "LEVEL" and "GAIN". 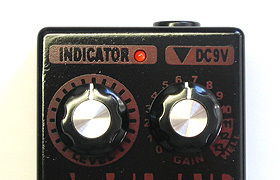 "LEVEL" controls the overall output level when the effect is on. "GAIN" controls the overall gain level when the effect is on. There are 13 scales for the "GAIN" knob from 11 to 13 is called the "HELL" zone! On the right side, there is an INPUT jack. There is a jack for an AC ADAPTER on the top. On the left side, there is an OUTPUT jack where super high gain distortion is output! There is a three band equalizer on the back. From the top, "MID", "HIGH" and "LOW". Use a philips head screwdriver to adjust. The specification may be changed without further notice. 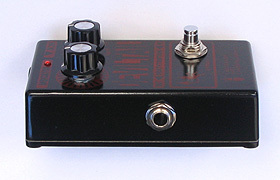 If you don't like noise, or feedback or possible squealing from your pickups, this is not the pedal for you! It's REALLY high gain.